The initial plan, given the tremendous size of particiaption at the 2012 Ronstan A-Class Catamaran World Championship, was to split the fleet into four divisions and have each division race each other in a round robin group stage, with the top half of each group moving on to the championship round on day four and the bottom half racing in the silver division. It was an idea borrowed from the F18, a class that Principal Race Officer Billy Richnow of The Great Texas Race fame is very familiar with. 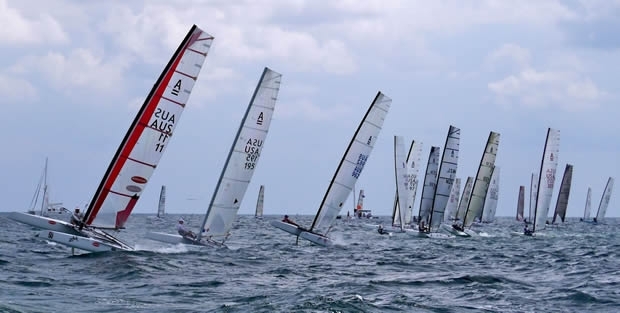 However with the forecast for the event looking aggressive and high winds expected to bring fleet numbers down somewhat, regatta organizers have decided to go back to the traditional fleet racing format. The forecast for the event is winds of 15 knots or more all week with Tuesday looking particularly nasty, and the idea that this could compromise the quality of the qualifying races ultimately turned the race committee against the idea. “The number one goal is to have a good regatta” said Hall, “and the last thing we want is people feeling like they got short changed on the qualifying races. course thanks to a rudder and daggerboard blowing up on the way out, and Great Britain’s Chris Field also lost his rudder when he ran over a turtle on the first beat. Whether the conditions will effect the outcome of the regatta is unclear since, though the A-Cat fleet does get spaced out when the breeze comes up, it is hard to say that the conditions actually work in any one competitor's favour. “As in any other class you see guys around the top in heavy air that wouldn’t normally be there, just like you see guys at the front in light stuff who wouldn’t be there if it were breezy,” said Regatta Co-Chair Ben Moon. “But in general the fast guys are fast regardless of what the wind does.” There are sailors in the fleet with a history of good results in difficult conditions. The current World Champion Steve Brewin took home first place in 2011 by catching Scott Anderson on the final day in extremely aggressive conditions. But if the practice race is any indication the gaps will be bigger and mistakes will be magnified, but the top sailors will be around the top no matter what the weather does. Only now the variable of the qualifying races has been removed.